The Outfound Festival is coming to our home of Hood River this weekend, June 9-11. It checks a lot of boxes for why we moved here: new experiences, learning to do something new with our bodies, instilling a sense of adventure in our daughter, connecting with industry leaders and growing bike tourism. Why We Moved to Hood River? Hood River came on the map for us about 5 years ago when I saw the listicle, Best Cities to Raise an Outdoor Kid. What is this mythical Oregon city on a river that calls itself the "Windsurfing Capital of the World"?! I read more about it and was smitten with the idea of raising our daughter in a culture of outdoor and independent play. But I still needed to quantify the decision to move. My husband, the Excel nerd, came to the rescue and together we developed a livability index to help us find my Oxymoronic Utopia, where you can live car-free daily and escape to the woods on the weekend. Amenities important to the Utopia included Walkscore, car share or car rental, bike friendliness, an Amtrak station, decent breweries, a farmer's market, bike tourism opportunities and the food scene. Bike Camping at Tucker Park, a 5 mile bike ride from downtown Hood River. Out of 50 cities, Hood River was #6 (behind Seattle, Portland, San Francisco, Boulder and Madison), and thus began the process of scheming and stalking our way into moving to the city, which happened August of 2016. Mayor Paul Blackburn pied piping kids to school with "Roll on Columbia" on National Bike/Walk to School Day last October. And in the short time of living here, various festivals have reaffirmed our decision to move like the Hops Fest, Cider Fest and Gorge Paddle Fest, and now comes the Outfound Festival this weekend. So why am I excited about this one? Learning to kite board and windsurf are my #1 priorities this summer. After having the outdoor lifestyle in the midwest, south and northeast, we are looking for unique and different. With waterfalls, water and wind sports, hiking, biking, snow sports and camping, the gorge has it all and I look forward to be inspired and educated about them all. Any time I can see a live band outside next to water, I'm in. Throw in local community, films, food, and drink, even better. Sun rises and sets in Hood River are otherworldly. 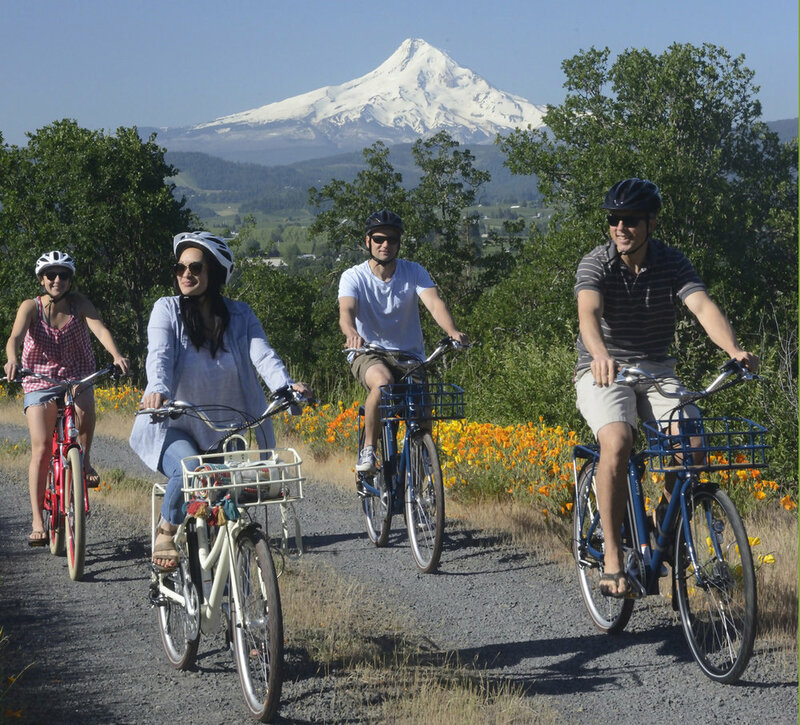 Oregon Ebike rentals starting up this summer! With the Historic Columbia River Highway set to be connected by 2022, the Gorge is sitting on a gold mine of happy experiences and international tourism dollars. But some of the hills and distances are still daunting to normal people and families. Enter electric bikes! I call the section of the highway trail between Hood River and Mosier the best under 10 mile bike ride in the country! And what better way to experience this outdoor amenity than with the smile generating power of an electric bike. I am working with Oregon Ebikes, opening their shop this summer, to create a series of custom curated handlebar maps that will take their rental customers to the best scenic vistas, breweries and wineries that this side of the Gorge has to offer. I couldn't be more excited that Oregon Ebikes will be growing my family biking community and draw a new type of tourist to Hood River and I look forward to spreading the gospel of the Highway and electric bikes this weekend at the festival. My daughter and I enjoying one of the many family rides along the Historic Columbia River Highway.